Jehoiachin, also known as Jeconiah (Hebrew: יְכָנְיָה, jəxɔnjɔh, meaning "God will fortify"), was one of the last kings of Judah. The son of King Jehoiakim, his reign in Jerusalem began upon the death of his father around 598 B.C.E. at the age of 18, near the beginning of the Babylonian siege of Jerusalem. Jeconiah/Jehoiachin was a contemporary of the prophet Jeremiah, who counseled a policy of non-resistance toward Babylon, had been a bitter opponent of his father, and strongly denounced Jehoiachin as well. After reigning for only three months and ten days, Jehoiachin was removed from office by the Babylonian army of King Nebuchadnezzar II. Jehoiachin was taken in chains to Babylon and imprisoned, while his household, most of the officials of Judah, and many craftsmen and merchants were forced into exile. His uncle Zedekiah replaced him as king under Babylonian's supervision in Jerusalem. After 36 years in captivity (562 B.C.E. ), he was removed from prison by the Babylonian King Amel-Marduk. Cuneiform records dated to 592 B.C.E. mention Jehoiachin and his five sons as recipients of food rations in Babylon. Later rabbinical literature preserves a number of legends about Jeconiah/Jehoiachin, who is seen as repentant while still young, living out his days as a faithful servant of the Jewish law during his imprisonment. In Christian tradition, Jeconiah/Jehoiachin is one of the ancestors of Jesus (Matthew 1:11), and Jewish tradition sees him as one of the ancestors of the future Messiah. Jehoiachin's father, Jehoiakim, destroys the writings of Jeremiah. Jeconiah/Jehoiachin lived at a time when the Kingdom of Judah found itself sandwiched between two colliding great civilizations: Egypt and Babylonia. His father Jehoiakim was the eldest son of King Josiah. When Josiah was killed in battle against Pharaoh Necho II of Egypt at Megiddo, he was succeeded by Jehoiakim's younger brother Jehoahaz (Shallum). The pharaoh soon deposed Jehoahaz and replaced him with Jehoiakim, who paid heavy tribute to Egypt and created domestic disapproval by raising taxes as a result. During Jehoiakim's reign, Nebuchadnezzar II, in a move to counter Egyptian influence in the region, invaded the Levant and made the Kingdom of Judah his vassal. The prophet Jeremiah warned Jehoiakim to focus on religious and ethical reforms, or else, "this place will become a ruin" (Jer. 22:3-5), resulting in bitter enmity between the king and prophet. After three years, Jehoiakim attempted to throw off the Babylonian yoke, resulting in a Babylonian invasion and siege, during which Jehoiakim died, apparently of natural causes. Jehoiachin/Jeconiah thus took power in extremely unfortunate circumstances. He reigned a little over three months, but these months were very eventful. He was scarcely on the throne when Nebuchadnezzar II's forces reached Jerusalem and began their siege. Jehoiachin, like his father, saw resistance as the only honorable course. However, for the prophet Jeremiah, Nebuchadnezzar was "God's servant," sent to punish Judah for her sins. The prophet Jeremiah condemns Jehoiachin. Jehoiachin did not hold out long against the power of Babylon's armies, with Nebuchadnezzar himself reportedly participating in the siege. He surrendered and was taken in chains to Babylon, together with many of Jerusalem's leading citizens. The treasures of the palace and the sacred vessels of the Temple were also carried away. Nebuchadnezzar found what he believed was a suitable replacement for him in the person of his uncle, Zedekiah. For 36 years Jehoiachin remained in prison at Babylon. When Nebuchadnezzar died, his son Amel-Marduk (called Evil-merodach in the Bible) released Jehoiachin and gave him an honorable seat at his own table (2 Kings 25:27-30). Archaeological excavations around 1900 uncovered Babylonian administrative documents which, when finally deciphered in 1933, described food rations for Jehoiachin and five of his sons. A cuneiform text of the document is publicly displayed in the Pergamon Museum of Berlin. Legend holds that Nebuchadnezzar II met with representatives of the Great Sanhedrin near Antioch, to whom he announced that he would not destroy the Temple of Jerusalem if the king were delivered up to him. When the king heard this resolution of Nebuchadnezzar, he went upon the roof of the Temple, and, turning to heaven, held up the Temple keys, saying: "As you no longer consider us worthy to be your ministers, take the keys that you have entrusted to us until now." Then a miracle happened; for a fiery hand appeared and took the keys, or (in other versions) the keys remained suspended in the air where the king had thrown them. (Lev. R. l.c. ; Yer. Sheḳ. vi. 50a; Ta'an. 29a; Pesiḳ. R. 26) This event saved the king's life, as he now surrendered both to God's will and to Nebuchadnezzar instead of being killed in battle. Jehoiachin as well as all the scholars and nobles of Judah were then carried away captive by Nebuchadnezzar. The first century C.E. Jewish historian Josephus tells the story somewhat differently. He states that Jehoiachin gave up the city only after the Babylonian king took an oath that neither his family nor the city should be harmed. However, Nebuchadnezzar broke his word, for scarcely a year had elapsed when he led the king and many others into captivity. Jehoiachin's sad experiences at a young age reportedly changed his nature entirely. He repented of the sins which he had committed as king, and he was pardoned by God, who revoked the prophetic decree of Jeremiah to the effect that none of his descendants should ever become king (Jer. 22:30). He is thus to be the ancestor of the Messiah (Tan., Toledot 20). His firmness in fulfilling the Law was the decisive factor in restoring him to God's favor. Tradition holds that Jehoiachin was kept by Nebuchadnezzar in solitary confinement. As he was therefore separated from his wife, the Sanhedrin, which had been expelled with him to Babylon, feared that at the death of this queen, the house of David would become extinct. They managed to gain the favor for the Babylonian queen, who induced Nebuchadnezzar to ameliorate the lot of the captive king by permitting his wife to share his prison, and thus had several sons (Lev. R. xix). Jehoiachin was one of those historical figures who was born at the wrong time and place. Ascending the throne at only 18 years of age with the fierce army of Nebuchadnezzar approaching, he can hardly be blamed from continuing his father's policy of resistance to Babylon. This, however, put him squarely at odds with the prophet Jeremiah, who denounced the young king in the severest possible terms. However, the Book of Jeremiah makes it clear that other prophets must have advised him in an opposite direction. 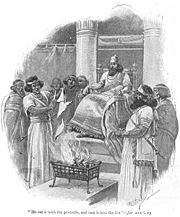 Rabbinical tradition holds that he eventually came around to Jeremiah's point of view and surrendered to Nebuchadnezzar after a miracle showed him that God no longer desired him to remain in office. 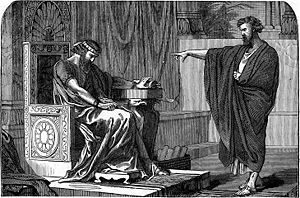 Tragically, Jehoiachin's uncle Zedekiah, who succeeded him on the throne of Jerusalem, also came to reject Jeremiah's advice. While cooperative at first, he gave in to political pressure and the advice of false prophets, rebelling against Nebuchadnezzar and bringing about the destruction of both Jerusalem and its Temple around 586 B.C.E. Thus the Kingdom of Judah came to its end, and the period of Babylonian exile entered its harshest phase. This page was last modified on 27 November 2018, at 23:15.